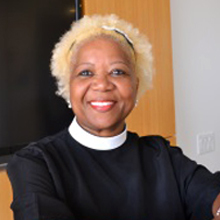 Reverend Leslie Watson Malachi is the director of African American Religious Affairs (AARA) at People For the American Way and People For the American Way Foundation. Representing 2,200 women and men from various Christian traditions across the country, AARA endeavors to build a strong association of progressive clergy, theologians, seminarians and ministry lay leaders who encourage African American churches and communities to become more civically engaged and promote social justice programs and policies. Recognized by the Center For American Progress as one of “15 Faith Leaders to Watch in 2015,” Reverend Watson is the former national policy director for Balm In Gilead and served for nine years as the director of the Multicultural Programs Department of the Religious Coalition for Reproductive Choice. She also served as the national coordinator and field director for the National Rainbow/PUSH Coalition. Reverend Watson is a master trainer, and has provided training to over 25,000 leaders within the African American faith community for over 28 years. Reverend Watson’s work has been featured in a number of national outlets, including NBC, Cosmopolitan, and The Huffington Post. Raising the Rent on the Lowest-Income Families? Not On Our Watch.